“It is breathtaking that toxic air pollution in London has breached the legal limit for a whole calendar year within a few days. 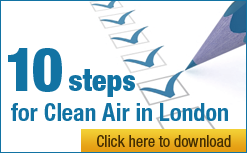 Special thanks to the London Air Quality Network for diligently reporting it. “Worse, several air pollution monitors have been vying for the dubious honour of recording the first officially monitored breach of the nitrogen dioxide (NO2) legal limit in the world in 2016. Oxford Street would have been first again if it hadn’t been ‘offline’ since last Sunday afternoon – possibly due to vandalism of the scientific equipment. “Boris has still not produced any official monitor from anywhere in the world that reports worse results than London and – even if he did – scientists say London will tend to have the highest NO2 concentrations in the world because of its diesel pollution. “This shocking start to the 60th anniversary year of the world’s first Clean Air Act in 1956, illustrates the scale of Boris’ failure to reduce diesel fumes, which are the main source of NO2 at street-level, and protect hundreds of thousands of people on our busiest shopping streets. “With Boris already irrelevant, Clean Air in London demands ‘bankable’ promises from all the Mayoral candidates to ban carcinogenic diesel exhaust from the most polluted places by 2020, as we banned coal burning so successfully 60 years ago, with an intermediate step by 2018. They must stop fobbing us off with bland statements and ignoring this issue that effects the health of every Londoner. Only George Galloway and Sian Berry from the main parties have promised so far to lead a Clean Air Revolution, if elected.